When it comes to electric transportation, it’s hard to beat an electric bicycle on efficiency. They are lightweight, narrow and can cram batteries in the negative space of standard bike frames. But one Danish startup appears to have gone even further, and all they had to do was lay down. Engineer and designer Lars Oksbjerre built the VELOKS MK3, a full suspension electric recumbent tricycle that has a range of 660 km (410 mi). I have always wanted to make, design and build a product from the bottom up. It’s fully suspended, has a double wishbone suspension and geometry like a car. I have designed it so that everything from the start is focused on being able to drive with electricity. As a tadpole trike, it uses a layout with two wheels in the front and one wheel in the rear, which is the opposite of most tricycles, but is more stable and handles better at higher speeds. 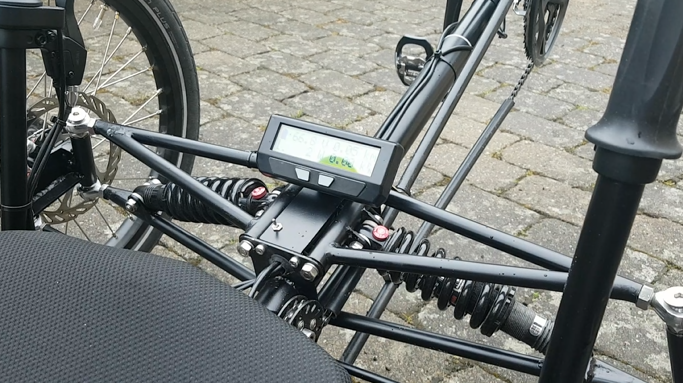 The full suspension VELOKS MK3 uses a 3,000 W Cyclone mid-drive motor, that can be electronically limited to 250 or 500 W to comply with European laws regarding electric bicycles and speed pedelecs. The motor uses a torque sensor to apply power up to 25 km/h (15.5 mph), at which point the motor power diminishes and you must pedal harder to reach higher speeds. In the off-road setting though, the trike can hit speeds of 60 km/h (37 mph), though this mode is strictly for private property use. The VELOKS MK3 achieves such impressive range in part because of its massive battery, custom-built by VELOKS from Panasonic battery cells. At 4 kWh, this battery pack is larger than nearly any other electric bicycle or tricycle on the market. And because it is mounted so low on the trike, it adds more stability in fast, tight turns to prevent rollover. If the 660 km (410 mi) range of the 4 kWh battery is more than you need, there’s an option for just 1 kWh of battery, which should be enough for 165 km (103 mi). That type of efficiency is nearly unheard of, at only 10 Wh/mi (6 Wh/km). Just for reference, consider that the efficiency of the Tesla Model 3 is closer to 237 Wh/mi (142 Wh/km). That means that an already efficient EV like the Tesla Model 3 requires over 20x the amount of energy to travel the same difference. Of course we have to be fair and concede that a car has many added benefits that must also be considered, not the least of which include cargo capacity, speed and safety. And of course the two vehicles travel at different speeds, causing the juxtaposition to be a bit of apples and oranges. But just looking at a pure energy comparison, it is interesting to see just how little energy is needed by a recumbent electric trike in comparison to a car. To look at it yet another way, VELOKS MK3 could travel more than a kilometer (0.6 mi) on just the energy stored in an iPhone battery. The main efficiency advantage of recumbent bicycles and tricycles is their riding posture, which is essentially laying on one’s back. Unlike riding a standard bicycle, where the rider sits upright and creates a large wind sail with their body, a recumbent allows the rider to lay down feet first, minimizing their cross-section and thus minimizing the coefficient of drag of the rider and bike together. On most of my electric bicycles, 25 Wh/mi (15 Wh/km) is a respectable range that I can achieve with an upright riding position and average speeds of around 35 km/h (22 mph) using throttle only – no pedaling. But as efficient as my e-bikes are, I’m still burning two and a half times more energy than the VELOKS MK3. For many e-bikes, this type of efficiency and range would be largely academic, because who wants to sit on a bicycle seat for hours at a time? But with a recumbent, you’re laying down on a padded seat, relaxed and enjoying the ride. It’s this combination of efficiency and comfort that make electric recumbent bicycles and tricycles such perfect vehicles for touring. That’s a bit more cavalier than I’d be, but hey, the man has a lot more time in the saddle than me. You might want to sit down when you hear the price, though. Or lay down. Perhaps on the VELOKS MK3. It starts at €5,340 including VAT ($6,290). Which is a lot, I know. But if you consider that a good quality full suspension recumbent trike already costs $4,500 without any electric drive, then the price is suddenly quite reasonable for what you get. If you take a step back and admire the vehicle for what it is, I think it’s pretty amazing. Guys, this is an electric vehicle that can travel over 400 miles comfortably, in the size of something you can pick up with your bare hands. It can go 100 miles further than a Tesla Model 3 with just 1/10th of the battery. That’s just cool. Practically speaking though, an electric recumbent trike probably isn’t going to be my next form of transportation. For city riding, I like sitting up higher to have a better view of both the cars around me and the road in front of me. The type of trip I can see this thing being really useful for is long road trips and XC touring. 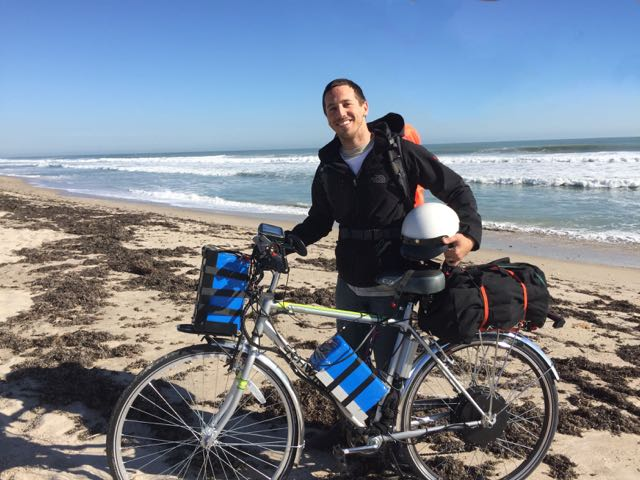 I did my own cross country trip a few years ago on a custom-built ridiculous monstrosity of an e-bike (below) with around 3 kWh of battery (two 72V 20Ah packs), which was enough for over 100 mi (160 km) per charge at 30 mph (48 km/h). But sitting for nearly 4 hours on that thing, even with a super plush seat, was anything but fun. I would have loved to have the VELOKS MK3 then!